Chicago Students at De La Salle Institute and Roosevelt Middle School in Bellwood have been named a Best in State winner in Verizon’s fifth annual Innovative Learning App Challenge. The students’ winning app idea was selected from more than 1,800 submissions nationwide. Each school will receive $5,000 from the Verizon Foundation as well as a tablet for each team member. 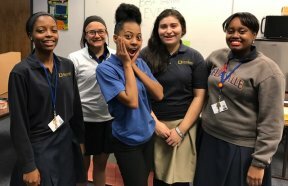 High school students at De La Salle Institute in Chicago developed a “Save Our City” mobile app concept that aims to combat violence around Chicago. The app utilizes a GPS sensor to notify users in real time of violent acts that have happened recently in the same area, allowing the individual to find a safe location. Students at Roosevelt middle school in Bellwood developed an “Incenti-Bucks” mobile app concept that reinforces students’ positive behaviors and rewards them via a paperless cash system which dramatically reduces the school’s paper waste. De La Salle Institute and Roosevelt middle school are now eligible to win one of eight Best In Nation Awards, selected by a panel of education and industry experts, and the Fan Favorite Award, determined by public voting, to earn an additional $15,000 for their school and the opportunity to work with MIT Media Lab experts to bring their app idea to life. The winning apps will be downloadable from the Google Play store. “Best In Nation” voting runs through February 14, 2017, you can vote to help local Chicago app challenge idea “Save Our City” or “Incenti-Bucks” win the Fan Favorite award by texting the code found next to the team’s entry at www.verizon.com/appchallenge/vote to 22333. Photo Caption: (Left to Right) Sydney Roberson, Michelle Vega, Morgan Lawson, Alexis Leon, Krystale Cole.